Western blot analysis of extracts from SH-SY5Y cells, untreated or treated with Oligomycin #9996 (0.5 μM, 30 min), using Phospho-Acetyl-CoA Carboxylase (Ser79) (D7D11) Rabbit mAb (upper) or Acetyl-CoA Carboxylase (C83B10) Rabbit mAb #3676 (lower). The phospho-specificity of the antibody was verified by λ phosphatase treatment. 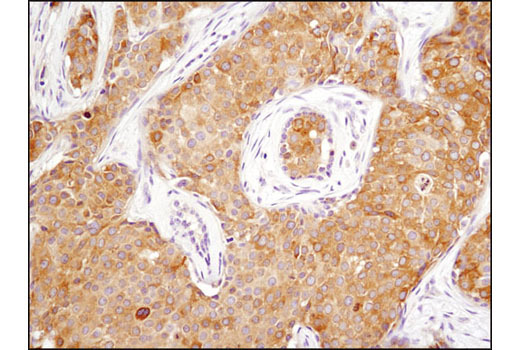 Immunohistochemical analysis of paraffin-embedded human breast carcinoma using Phospho-Acetyl-CoA Carboxylase (Ser79) (D7D11) Rabbit mAb. 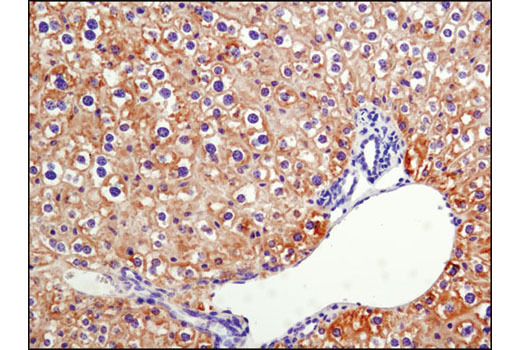 Immunohistochemical analysis of paraffin-embedded mouse liver using Phospho-Acetyl-CoA Carboxylase (Ser79) (D7D11) Rabbit mAb. 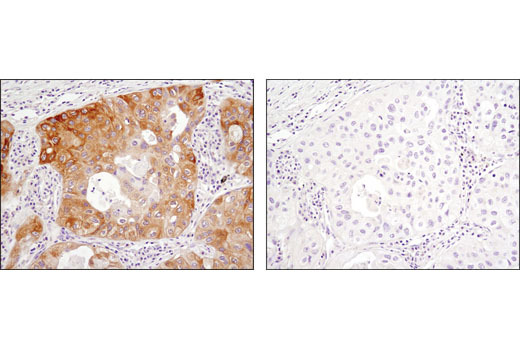 Immunohistochemical analysis of paraffin-embedded human lung carcinoma, untreated (left) or λ phosphatase-treated (right), using Phospho-Acetyl-CoA Carboxylase (Ser79) (D7D11) Rabbit mAb. 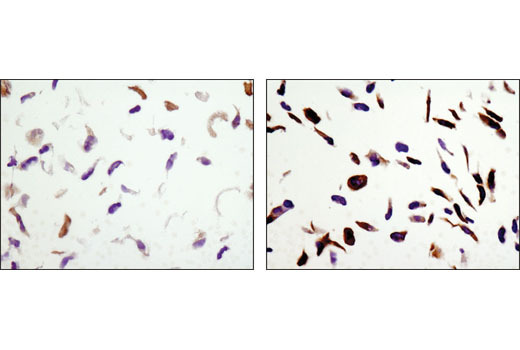 Immunohistochemical analysis of paraffin-embedded NCI-H2228 cell pellets, untreated (left) or phenformin-treated (right), using Phospho-Acetyl-CoA Carboxylase (Ser79) (D7D11) Rabbit mAb. 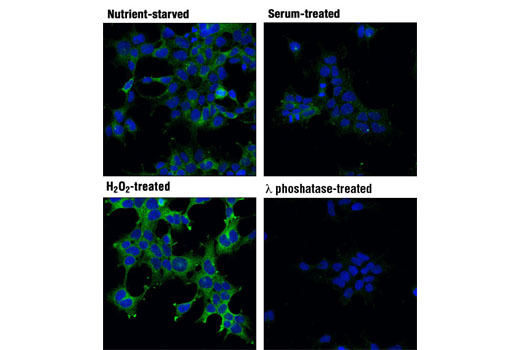 Confocal immunofluorescent analysis of 293 cells (all nutrient-starved with Krebs-Ringer bicarbonate buffer for 4 hr), starved only (top left), serum-treated (10%, 30 min; top right), H2O2-treated (10 mM, 10 min; bottom left), or λ phosphatase-treated (2 hr; bottom right), using Phospho-Acetyl-CoA Carboxylase (Ser79) (D7D11) Rabbit mAb (green). Blue pseudocolor = DRAQ5® #4084 (fluorescent DNA dye). 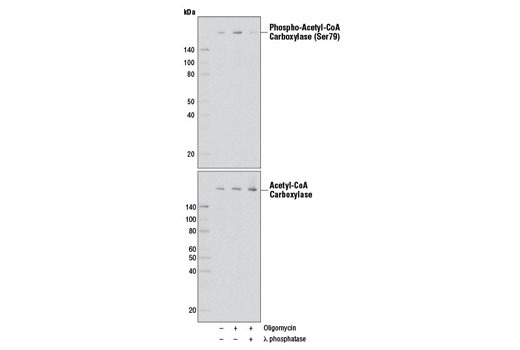 Phospho-Acetyl-CoA Carboxylase (Ser79) (D7D11) Rabbit mAb recognizes endogenous levels of acetyl-CoA carboxylase protein only when phosphorylated at Ser79. Monoclonal antibody is produced by immunizing animals with a synthetic phosphopeptide corresponding to residues surrounding Ser79 of human acetyl-CoA carboxylase protein.